Condition: Like new. The action cards are sleeved. Played only one time. 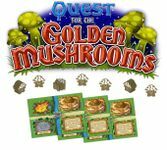 Tiny Epic Quest: Quest for the Golden Mushrooms - Never been played with.